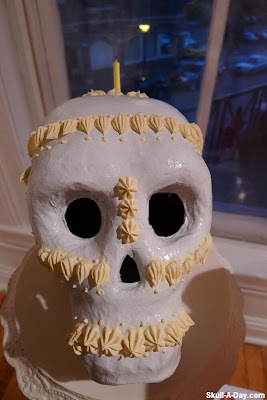 Artist Gretel Schwartzott based near NYC, NY sent us a few pictures from this year's Halloween festivities. 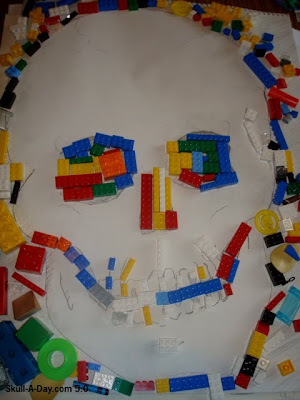 Ms. Schwartzott, and her family, made the most of the freak winter storm that interrupted Halloween this year in that part of the county by a creating this giant snow skull. This year's costumes included hand done skull masks for all members of the family. 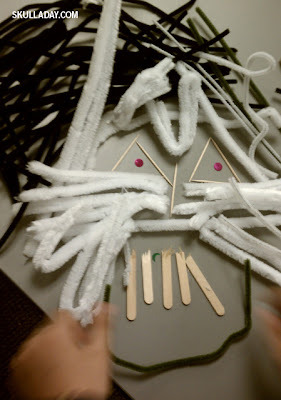 and one of the masks with the rest of the costume in use before the storm. 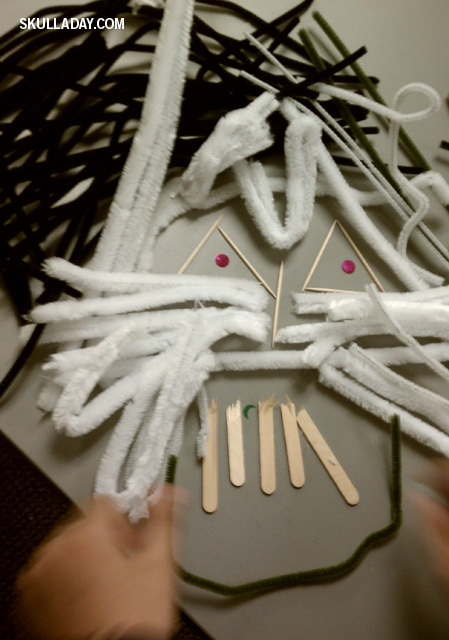 Thank you for submitting these wonderful pictures of your artistic talents. I am happy to see that your family was able to make the most of this year’s wacky weather situation. 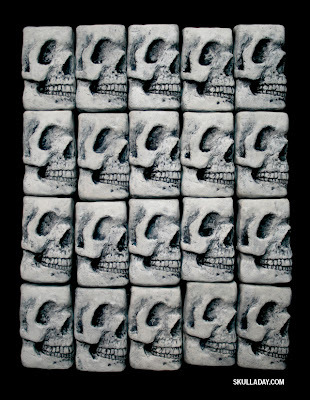 A Richmond, VA-based artist, Susanne K. Arnold explores the overlay of cultural memory and personal experience in her work, utilizing a personal vocabulary of images and the ancient painting technique of encaustic. 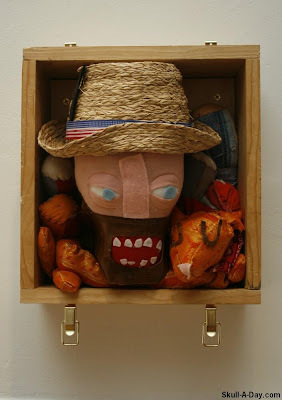 All of the 2011 Skulls are were on display at Gallery 5 through July 8, 2011. Please contact Gallery 5 directly for information on purchasing the artwork. 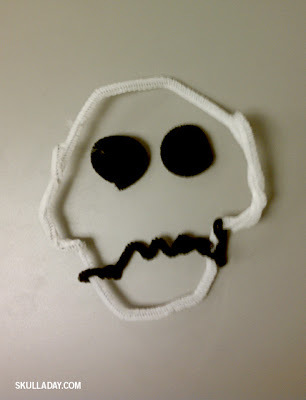 Chris at Tektonten Papercraft is sharing his first of "a series of papercraft video game skulls". This one is a skull from the Half-Life 1 video game. You can find the original post including the free downloadable template here. Take a moment to realize the journey of this skull. 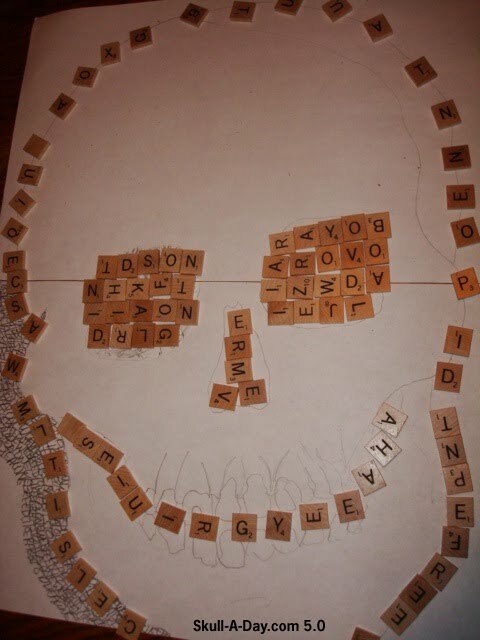 Originally thought of by someone who wanted to create a video game. 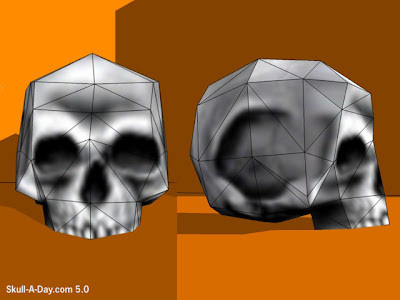 Luckily for us skulls were a part of the motif, and so someone else was hired to design this computerized skull to be a part of the game. 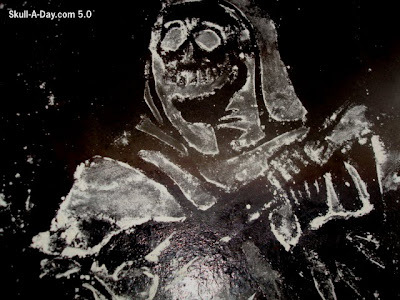 Of course we have a certain fan base who are into these types of video games and happen to share our love for skull art. In one case a certain fan who wanted to recreate the same skulls he had seen in these games decided to use his own creativity to produce a paper version of the same artwork that you can now download and assemble for yourself. 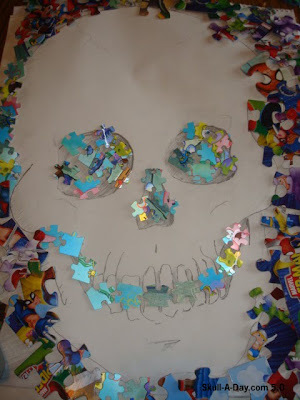 Now that's a lot of creative minds working on a common skull. How often do you think something like this happens? Well, now we can add at least once more to the list. Thanks, Chris! 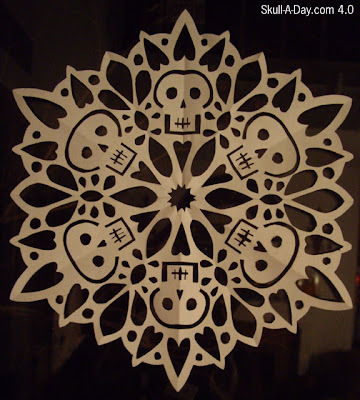 Oh yeah, don't forget to check out more the papercraft skulls featured from the past here on Skull-A-Day including some from the Skull Master himself in the FREE STUFF section. 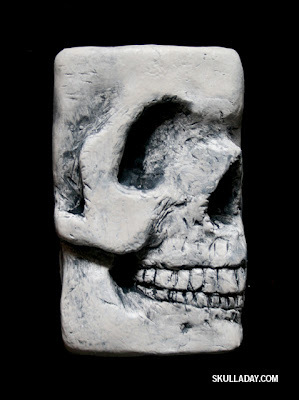 As part of the original Skull-A-Day project I created a limited edition of shrunken skulls for the 10th Anniversary of the Art-o-mat. This year I was invited to participate in the 10th anniversary celebration of the Art-o-mat's presence in my hometown of Richmond, VA. This time I created a piece that fits exactly into the cigarette pack sized boxes that the Art-o-mat machines dispense. I molded it out of Sculpey, then had it cast in plaster and hand painted each one. This is an edition of only 20 specifically for the machine that will be at The Visual Arts Center of Richmond. My work will be featured along 16 other local artists, including both of my parents! If you're in town I highly recommend coming to the opening event this Wednesday night since it will probably be your only chance to get one of these extremely rare pieces. Natalie VonRaven of Magisterian, from Alberta, Canada created this piece, titled "Lady Muerte" (Lady Death). I like the mixture of Dia de los Muertos iconography with the large vintage hair roll and makeup. 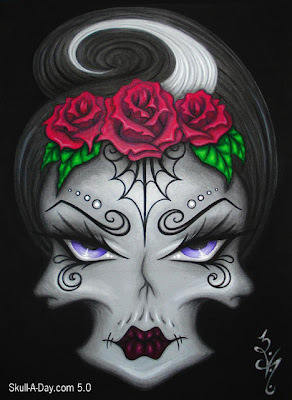 The flowers are found in both images of female calaveras and on 1940s vintage styled women. 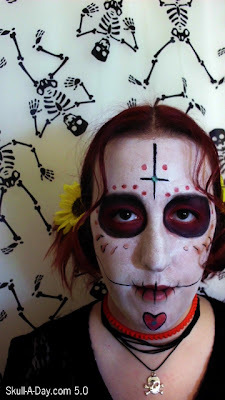 The makeup incorporates the cat eyes, arched brows and red lips commonly worn in the 1940s as well as the exaggerated details of calaveras and sugar skulls. 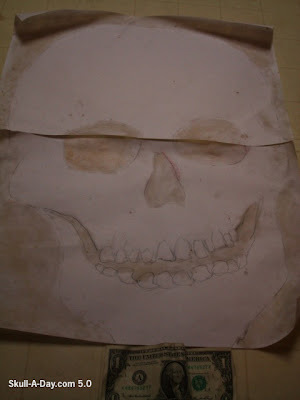 The sunken in style of the skull reminds me of skin shrinking on a skeleton in a warm dry climate. Wait. Did you see that?!? It's this week's round of simulacra as captured by our skull hunters. 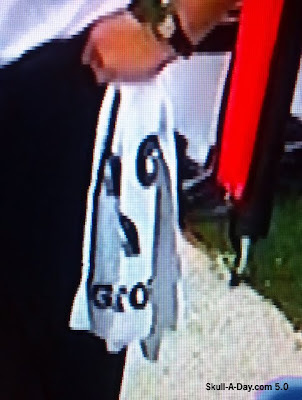 I caught a quick glimpse of this sneaky guy last Sunday while watching some good old American football. Thanks to my DVR for the assist. Jason Hirschfeld snapped a shot of this smiley skull in his cup of joe. And Casey Templeton of Richmond, VA caught this skull trying to hide behind a veil. Thanks as always to the diligent skull hunters who keep this Sunday tradition alive. Be sure to submit your skull simulacra to add to our magnificent trophy room. This Super Saturday skull collection is brought to us from James Fantini, an art teacher from Magnolia, Arkansas. This assorted collection is proof of variety being the spice of life. 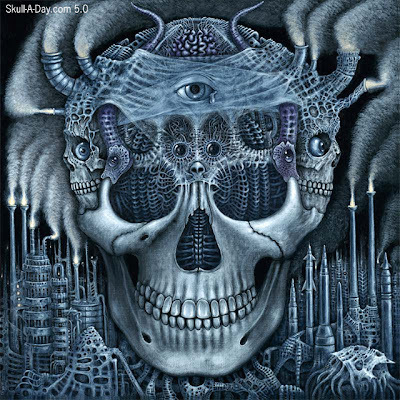 Having just celebrated Thanksgiving Day I wanted to say that I'm thankful for all of the teachers out there, thankful for all of wonderful skull art we receive, and mostly thankful for all of people who help make this site happen. Thanks for another lesson, James. Simulacra hunter Tyrone Hernandez from Kunkletown PA showed off an original screen print. 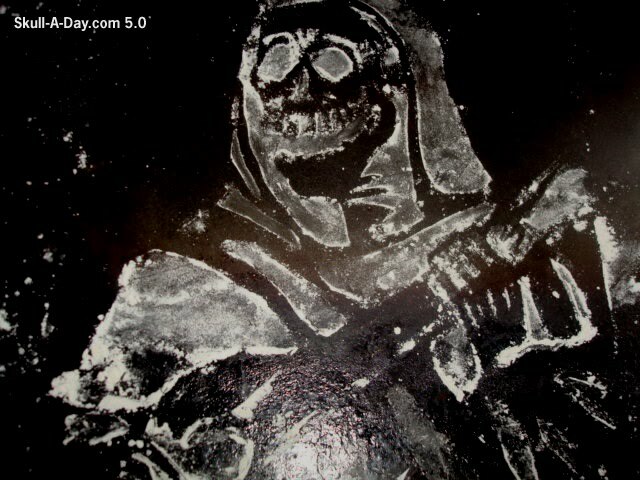 He said: “The medium is a very dirty window screen and a very clean finger. Nathan: I tried to go CSI, and find out what is on the front of the books, but alas I don't have the technology they have. 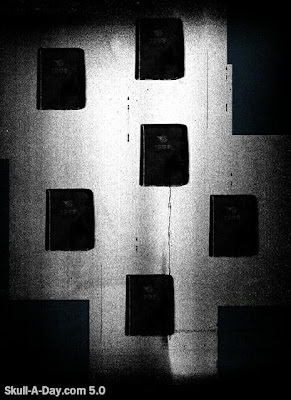 Are the books part of the significance? Tyrone: After many excellect simulacra, we are glad to feature an original piece by you, was is the story about its final fate? Thank you both for submitting these wonderful pieces for us to share. 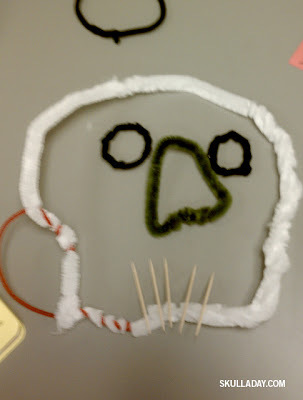 Since today is the “official” kick off to the holiday season I thought I would Flashback to some skullliday crafts from us as inspiration for something to give this year instead of waiting in line 18 hours for something to buy simply because it is “on sale”. 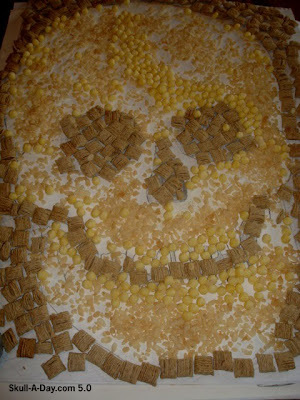 “Sarah Cous” approx. 4" X 3" Fresh orange pierced with cloves on a leather hanger. 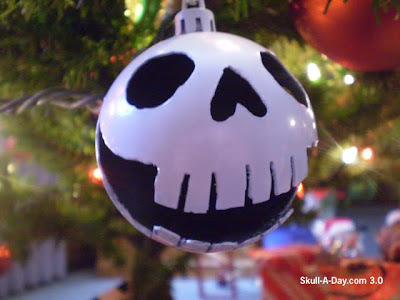 Wishing all of you Happy Skullidays. If you are inspired to create some skulltastic gifts or decorations please make sure you record your greatness and send the results this way to our Submission Box. Emily Parkinson of the Screaming Skulls Weird Club submitted some "Halloween photos I took of myself in costume as 'La Reina de Los Muertos' aka 'Queen of the Dead' ". 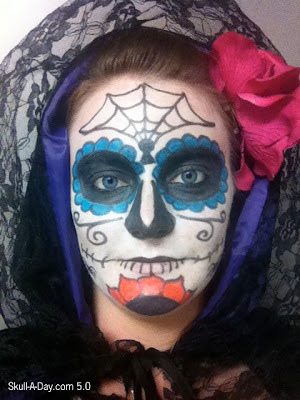 "My costume was inspired by the beautiful, macabre sugar skulls that are typically painted for 'el dia de los muertos' in Mexico, and I did the makeup myself." Sarah Lynn Duncan did this makeup. She said "The makeup took me a little over an hour to do and I'm pretty happy with the even-ness considering I did it on my own face!" 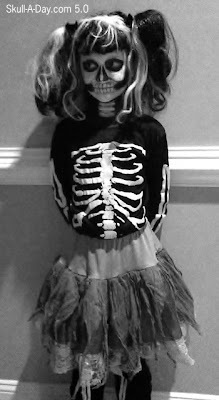 Mrs. Dee's daughter "Skella" wanted to look like a skeleton, so she fulfilled her daughter's request. I'm a big fan of skull makeup myself. I like the process of transformation and the reactions when other people see it. 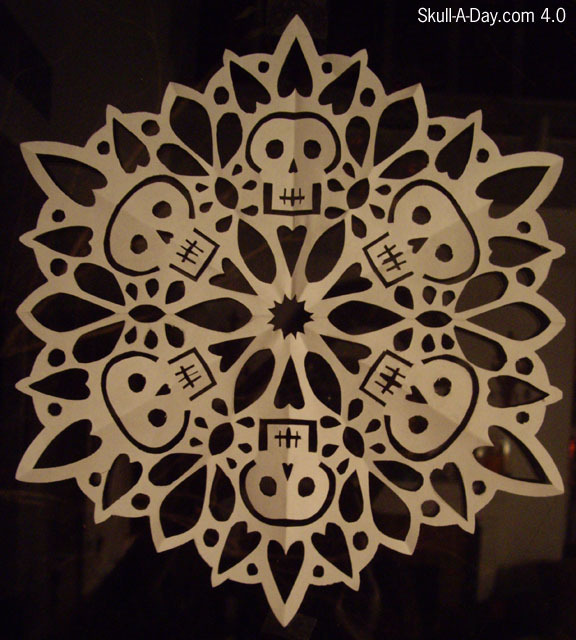 Dia de los Muertos celebrators have a wide range of design choices, because it's a personal celebration as much as it is group one. I like that individuality of the makeup, the costumes and the celebration. Here in America on the eve of our Thanksgiving holiday, preparing goodies for our annual feast, I thought this would be a wonderful time to show off a little inspiration for you to play with your food. 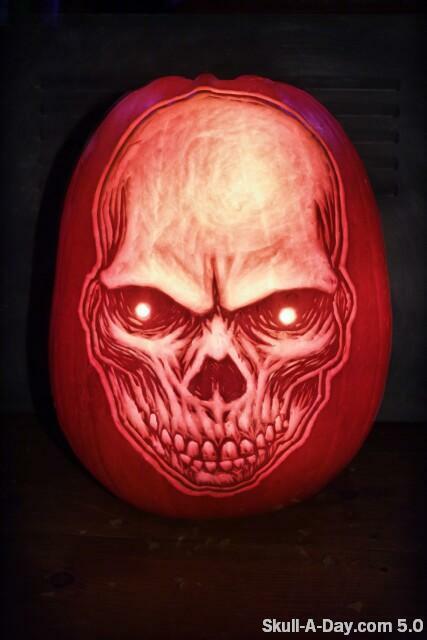 First up is Dillon Ingram from Columbia, SC who sent us this carved squash. 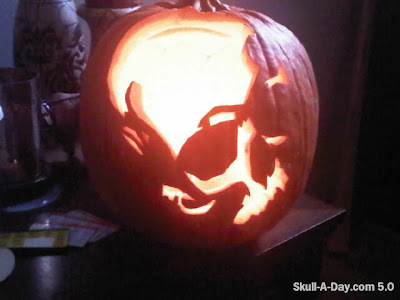 Last we have Jack who used The Skullmaster’s skull stencil to carve his pumpkin this year. Thank you all for submitting these wonderful carved examples of your artwork. Perhaps these will inspire others to get into a carving mood while they celebrate this next skulltastic holiday. “Happy Birthday Noah” is a gift and a theft or a borrow. 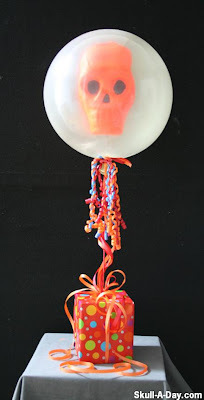 I stole the idea from the stuffed-bear–in a balloon gift, borrowed some insertion methods from elaborate equipment supposedly needed to impregnate the balloon with a passenger and then the limited lifespan gave it life. The gradual deflation of the balloon slowly revealed and wrapped the skull while staying suspended above the present, as scene HERE. For more work, completely unrelated to “Happy Birthday Noah”, go to robtarbell.com. 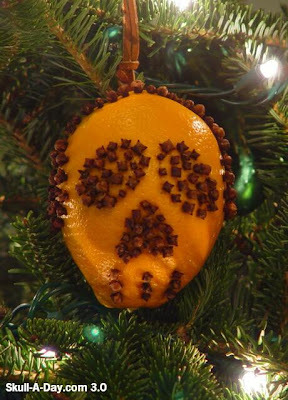 Think of it as sibling of my original Ornament(al) Skull. 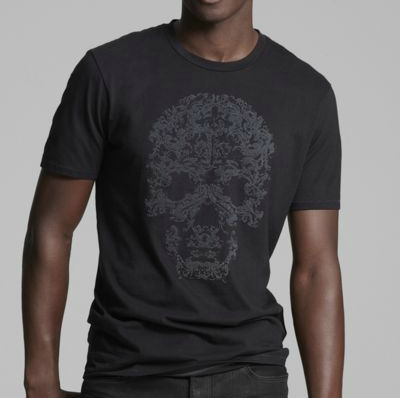 You can find the shirts on the Kenneth Cole site HERE. 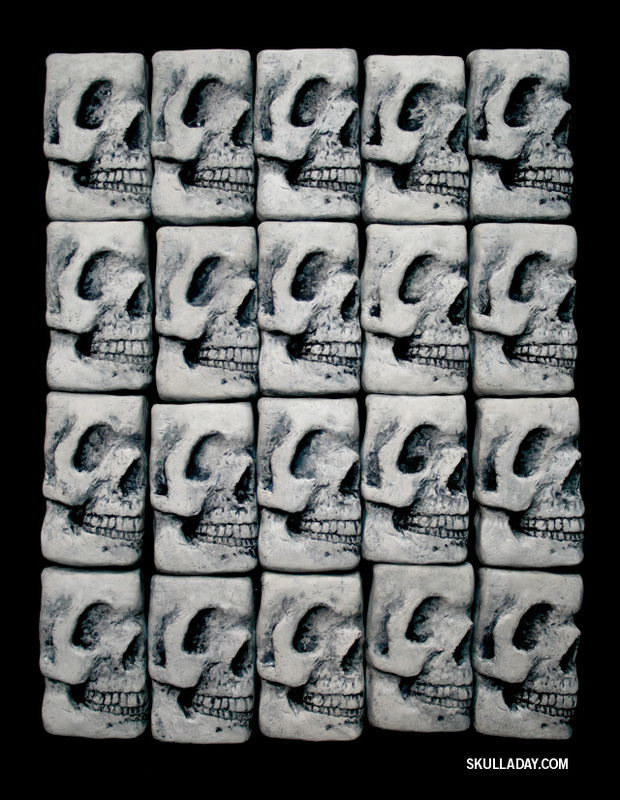 All the 2011 Skulls are were on display at Gallery 5 through July 8, 2011. Please contact Gallery 5 directly for information on purchasing the artwork. 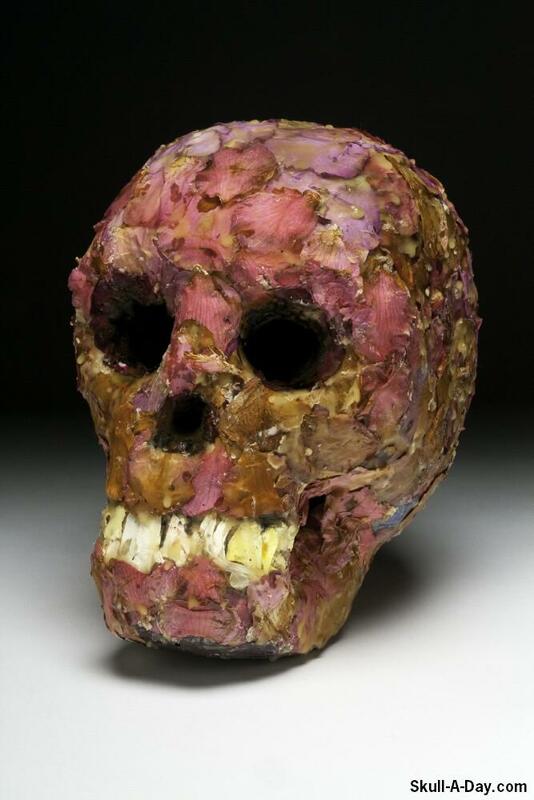 In a weird twist of fate, John-Paul Albinati and his wife Renee, makers of the hockey mask skull, return to us today with a different skull with a really familiar feel. 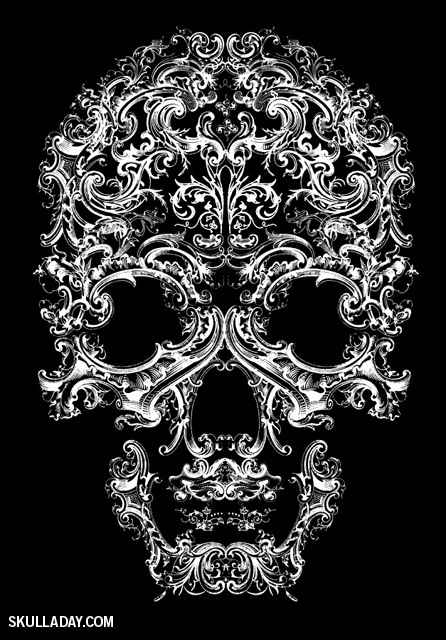 I suppose the two skulls make a fitting match since the wearer of the first spends so much time imitating the canvas of the second. Thanks to the Albinatis for another great "wall" painting submission on our visit to the Horsepower Ranch. 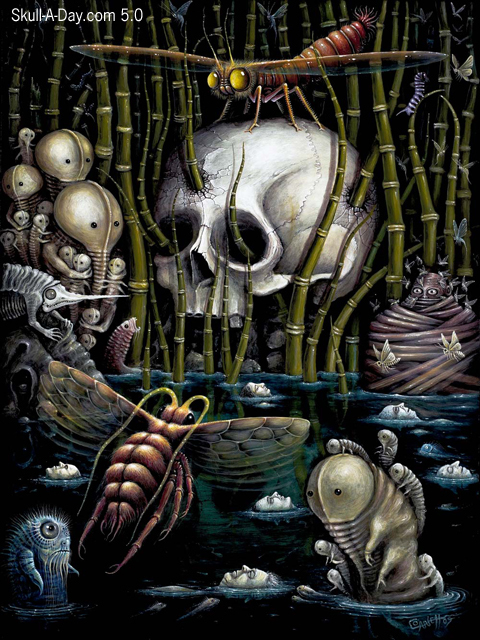 Robert Steven Connett is an artist working in Los Angeles, CA. He has "done quite a few 'skull oriented' paintings." More of his work can be found in his Art Store and Flickr. These remind me of what we fear in the night. Those things that we know are out there, but are unseen without night vision. The nocturnal lurkers of reality and fantasy come out of the darkness to be shown in these three artworks. Let's take a tour around the world on this week's simulacra safari. 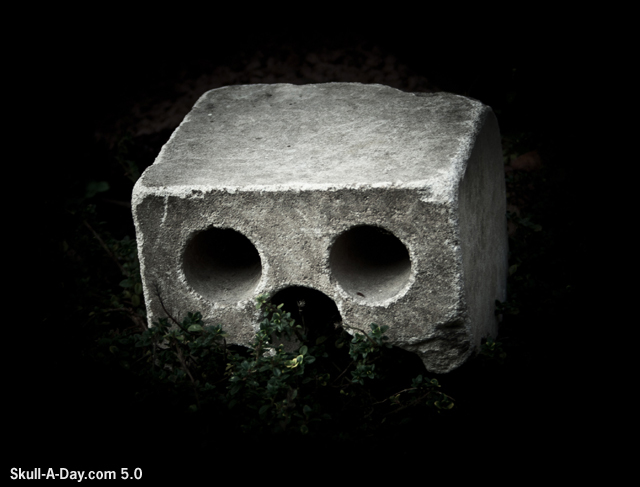 Our first stop is in Berlin, Germany with Rene Felk who captured this bony looking brick. 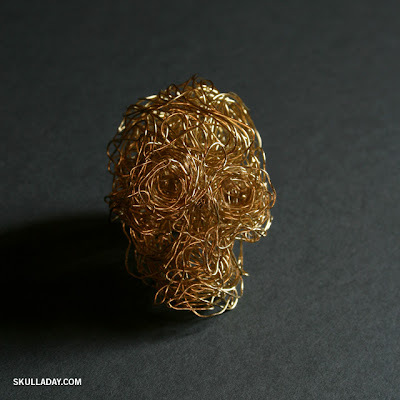 Next up we find ourselves in (location unknown) with Daniel Muñoz and this creepy CPU skull. And to complete our journey we land in beautiful Costa Rica with Roberto Chaves and his cooler skull who welcomes us with a tasty beverage. Thanks for the friendly submissions! Help us plan our next itinerary by submitting your secret skulls to keep this global trek alive and well. Deepa de Jour - "Feville"
My new book Unstuck is in stores today!